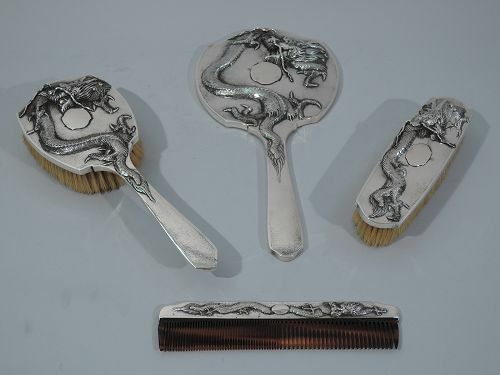 Chinese export silver vanity set, ca. 1900. 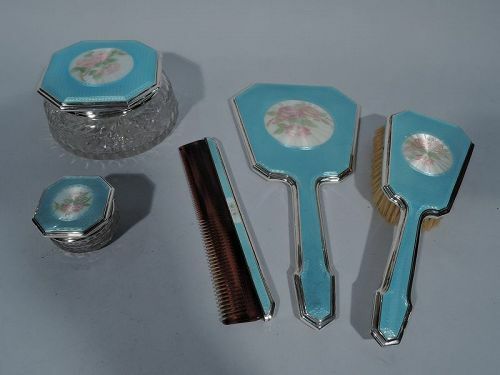 This set comprises 4 pieces: Hand mirror, hairbrush, hair comb, and clothing brush. 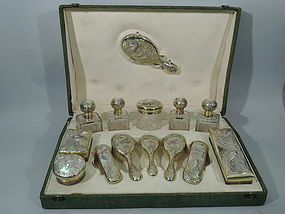 Art Nouveau vanity set in gilt 950 silver and clear glass. Made by Pierre Kotowski in France, ca. 1900. 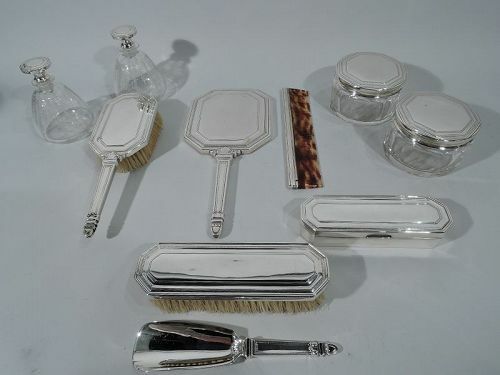 This set comprises 1 hand mirror (L 10 1/2 in. 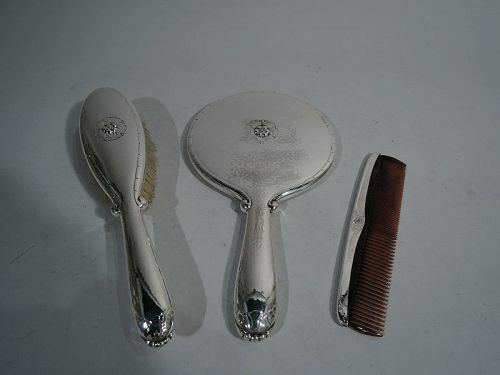 ), 1 hairbrush (L 8 1/4 in. 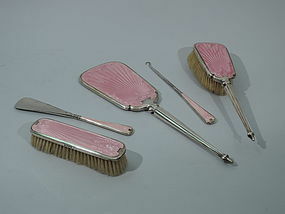 ), 2 hairbrushes (9 1/4 in. ), 1 clothing brush (L 8 in. ), 1 clothing brush (L 7 1/4 in. ), 2 colognes (H 7 7/8 x W 3 1/4 x D 3 1/4 in. ), 2 colognes (H 6 3/4 x W 3 x D 3 in. ), 1 jar (H 5 1/2 x D 4 1/8 in. ), 1 jar (H 3 1/2 x D 3 7/8 in. ), 1 box (H 3 1/4 x W 5 x D 3 3/4 in. ), and 1 box (H 3 x W 9 1/8 x D 3 1/4 in.). 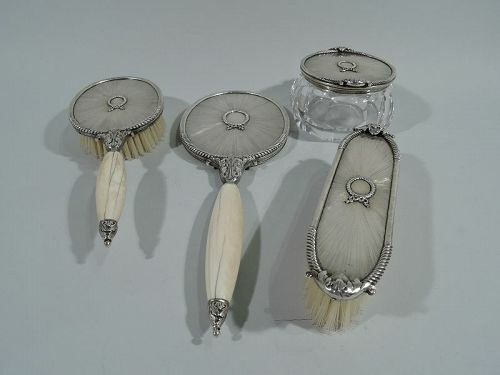 Sterling silver and clear-glass vanity set. 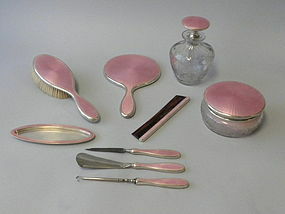 Made by T. G. Hawkes & Co. in Corning, New York, ca. 1910. 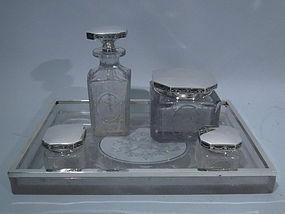 This tray comprises 1 powder jar, 2 rouge pots, and 1 scent bottle, all on tray.